"General Error: cannot complete the transformation"
Can someone give it try it a try and see if maybe it is something on my end? Interesting. I could do one letter at a time at the current size. I selected about half of them and tried it and got a Bug Splat. I tried doing limited groups of letters. The center row went fine as did the first two thirds of the top row. When I tried to do the last batch of letters in the top row, Splat! I got splats on the 'r 'in 'marian' and 'heart'. Never thought it make a difference... is because SU doesn't like expressions with number like 0.00000000000000000000000000000000002003 ? great plugins ! I use it a lot! Thank you !!! I just got that "transformation" error as well. While the attached SKP is documented, here's what happened. There are 2 errors depicted in the attached model. 1 - I tried to thicken (using JPP preset at 90 deg) the housing by .1 inch. Error. I read this thread and scaled up 10X, same result. If I do the hub and flanges separately, it works, but there is a mess to clean up. 2 - When I thicken any pair (or more) faces that are at an angle to each other, and any face has a hole in it, the hole thickens at some median angle, not perpendicular to its face. The circle on the thickened face is also distorted into an oval/ellipse. There is one other transformation error I've noticed as well, but seems to happen in specific repeatable cases where the transformation logic is simply stumped for a good solution. I'll post a separate model of that problem if wanted. So now in those cases I know where to look and do a quick and simple fix. Believe me, JPP is a Golden Ruby I cannot live without. Apologies... First post I forgot the SKP file. Last edited by jgb on Fri Oct 14, 2011 7:39 pm, edited 1 time in total. 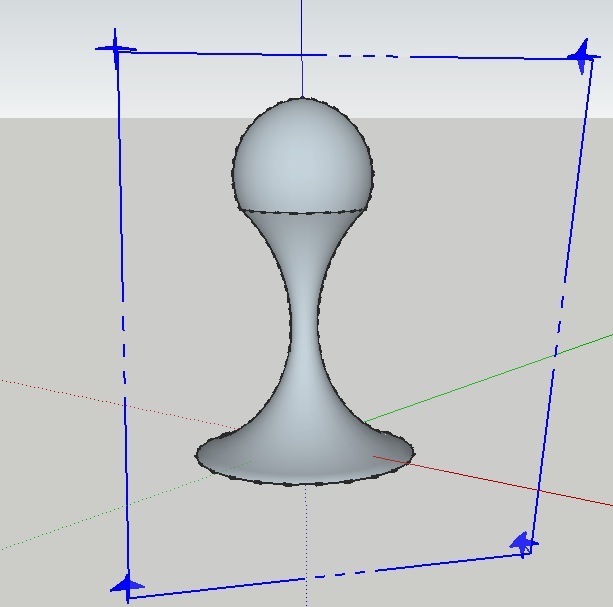 My apologies if this was answered before, but is it possible to use this plugin to uniformly add thickness to a cylinder-like object? 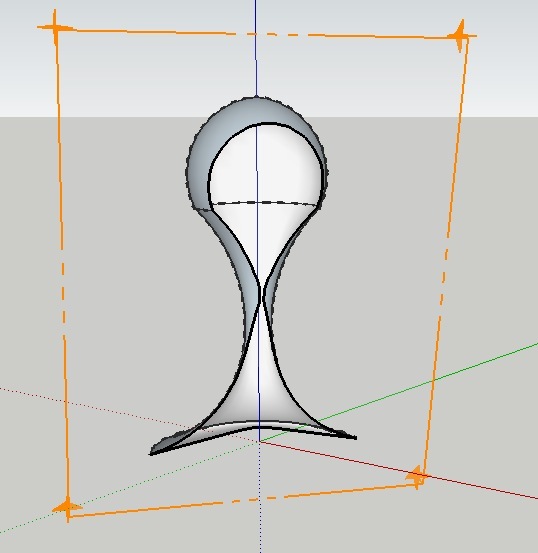 I created it by pulling a circle (and then scaling it at several points) and now would like to add some thickness to the currently hollow object, as it is going to be 3D printed. I am, in essence, trying to pull all the outside surfaces at a perpendicular angles. Yes. Use the Joint Push/Pull (not the Vector). Select the surface of the cylinder and using the JPP tool, click on any face in the selection. It will outline in red. Pull it up as thick as you want, or more accurately, pull up a short distance and type the thickness to the Measurements box. Press <Enter> to get a preview, then <enter> again to complete the thickening. Depending on the defaults you have for JPP, it may or may not form a group of the thickened section. You can explode the group if you want. @helios: Not to disparage such a fine tool as Joint Push/Pull, but a possible alternative is Pipe Along Path. Slightly different methodology, but similar result. mitcorb wrote: @helios: Not to disparage such a fine tool as Joint Push/Pull, but a possible alternative is Pipe Along Path. Slightly different methodology, but similar result. Yes, but PAP is not a tool for this problem. I use PAP a lot and its main advantage is making a tube or pipe along an arbitrary path. There are a few other solutions available to thicken the surface of a cylinder, or any shape, either in a straight line or a path. Follow-me is a so-so useful tool for a non-linear path. Making a circle with both inner and outer diameters then extruding the outer ring is probably best, but linear paths only. However, JPP is the only tool I know of that will equally thicken all surfaces, linear or not, and even bent/wavy surfaces, which was the case indicated by @helios. Think of an hour-glass. Thank you for the quick replies! It looks like this plugin is what I am after. Used to feel very good. Is it JPP polygon-limited ? I have a curved face and I wanted to add thickness to it. Unfortunately, JPP only affected a part of entire mesh. Could it be that the faces were pulled internally because of the direction of your pull and the inference engine trying to snap to a vertex? I don't know, just asking. mitcorb wrote: Could it be that the faces were pulled internally because of the direction of your pull and the inference engine trying to snap to a vertex? I don't know, just asking. I'm not sure what you are asking...but if is what I think it is, it should be valid only for small distances and only for mouse movement. Or, I moved the mouse to avoid snapping and I input a value in VCB. dereeei wrote: Is it JPP polygon-limited ? JPP has a limit for displaying the feedback wireframe (5000 faces) but I don'th think I put one for the processing. I'll check that and come back. I've Joint PushPull assigned to 'J' shortcut. When I select all geometry and press 'G' to 'Make Component' then 'Set component axis' if I press 'J' during the placing of the axis SU will Bugsplat. It doesn't do this for any other keyboard assigned plugin. It doesn't do it if nothing is assigned to 'J'. It doesn't do it if a native tool is assigned to 'J'. It doesn't do it if another plugin is assigned to 'J'. There are no messages in the Ruby Console. I'm using all the latest version of your plugins. After a few days, I'm still struggling to give one of my hollow models some thickness. What am I doing wrong? How can I get the walls to be thicker? Here's the model in question itself (attached). It worked for me although I probably added the thickness in the wrong direction. After you select the JPP tool, hit TAB and make sure you've selected "Thickening". If you have "Erase Original Faces" selected, the original faces will get erased and you won't get the thickness. Another thing I did was split the operation into several smaller ones by selecting sections of the shape. I started at the bottom and selected just the surface below the belt and ran JPP on it. Then I worked my way up from there. I would have guessed that faces need reversing, and overall size of the object would need scaling to produce the effect, but this may not apply here. You're right. the faces were all reversed but that and the size of the thing didn't affect the operation in this case. Helios, I did forget to mention the face orientation thing and that you ought not to work so far from the origin. I updated the file to put the thickening on the inside so the little detail at the top shows correctly. The model could stand a bunch of cleanup but I'll leave that to you. Wow, you guys are awesome. Thank you so much -- this is way beyond what I expected for help! JPP precisely works on group of faces (just select them and activate the script). Thank you so much Fredo!